Sofa Collections There are 170 products. 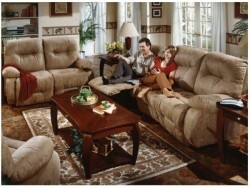 This dual -- reclining sofa is highlighted by a slight U-shape for a more conversational setting. Laurel is as sophisticated as its name implies. Yet it's far from stuffy. In fact, it's downright welcoming, with an eclectic look and relaxed personality. Button details, gently rolled arms and tapered wood legs add to its uniqueness. Kennedy has all sorts of admirers and it's easy to see why. Petite in scale with narrow arms, it fits nicely in smaller spaces. Welt trim gives it a wonderful finishing touch and its ComfortCore® zoned cushioned seating and fully padded arms and outer back mean it'll be just as comfortable and supportive for years to come. Casual comfort at its finest! The Talbot Sofa is clean and informal - optional pillow accents, contrasting welt and nail head trim are also available to help you create the look that's right for you. La-Z-Boy quality construction offers countless hours of durability and comfort. There's so much to love about Natalie. With classic lines, deeply cushioned seats and back, flared roll arms and wood legs, it's no wonder these two accent pillows call it home. The Hazel sofa is winning its fair share of admirers. And it's easy to see why. It has a beautiful and fresh new arm design, new and shapely wood legs which can't help but draw attention, and welt trim that emphasizes its graceful lines. Plus, it comes with two throw pillows. Pretty, pretty!